Today is the last day of my six-month Sabbatical. I am grateful to all who have made this season possible, and to my Lord for His grace and gifts. I had an amazing time in Toronto and other parts of Canada. Having made new friends there, I hope to return one day. 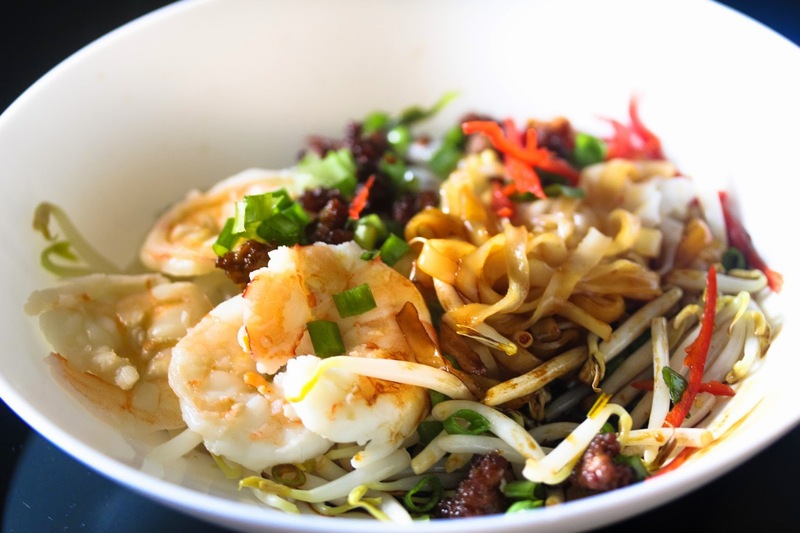 While the food in Toronto is quite good, it was difficult to create some local dishes such as hor fun (flat noodles) as the texture quality of the hor fun there is different. I thought it "cool" that today I could cook a nice dry version of hor fun for the family before I get back to the reality of life and work tomorrow. I love dry noodles. While I like soupy ones too, I have always tended to order the dry versions. With some care, dry noodles can taste very good, even without using any stock. You will need good quality version of sauces like soy sauce, kecap manis, dark sauce etc. To that you need some lard. I have no qualms about using lard in my cooking as long as it is done in moderation. I find it strange that people feel queasy about lard, as if it is wrong to use it. They don’t feel the same about butter (and so much of it is used in cakes and pastries) and processed oil (i.e. margarine). As you can see in this recipe, you can easily make sumptuous dry noodles as long as you are organized and mise en place your ingredients. A few types of noodles will work for this recipe. Lard: Dice or mince the pork fat into pieces of about a square cm. I buy mine already minced from the market. Heat up a deep pan or wok using a small flame. Add the pork fat cubes. The oil will slowly ooze out. Leave it to gently fry for about 1 hour or more. When done, separate the lardon from the lard and fridge both for storage. To prepare the minced pork, add some lard into the wok. When heated, add some lardon and crisp it and using the spatula, break them up. Add the minced pork and stir fry. Add some soy sauce and dark sauce. It should be done in a minute or two. If you are using prawns to garnish, blanch the prawn meat and halve them. Prepare the other garnishes, i.e spring onions, chillies. Heat up a pot of water (for noodle blanching). Lay out the plates (or bowls) to be used for the noodles, one for each per serving. To the base of the plate, add dashes of kecap manis, dark sauce, soy sauce and white pepper. You can also add some fish sauce if you like. Blanch the bean sprouts and noodles for about 20 seconds. This is for the purpose of cleaning off the noodle oils and heating up the noodles. Shake off the water and add to the plate and mix the noodles and sauce at the base. 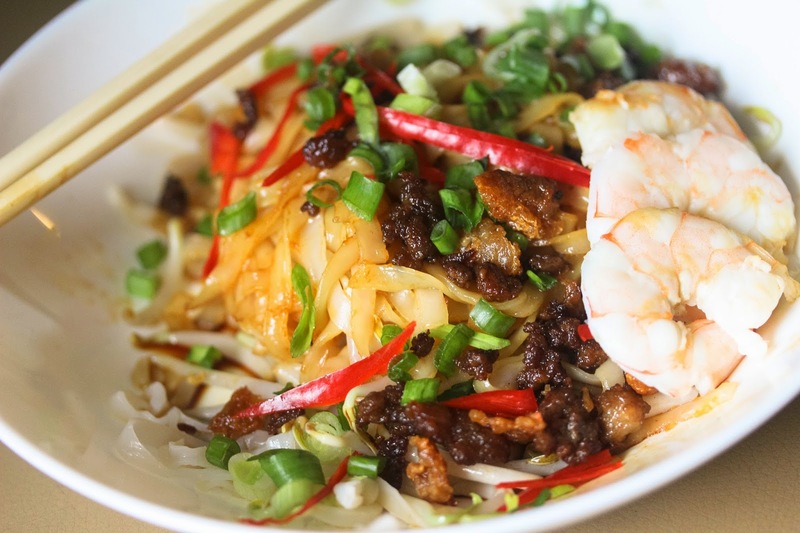 Garnish with the minced pork, sliced prawns, spring onions, fried shallots and chilies. Serve immediately.